I seem to have glossed over our new plan for 2008!! Whoops! Dave has put together a plan (which we discussed in the Albany) a few weeks ago. It includes the slug barrier - affectionately called the "Maginot Line" by Dave. Trust me, no German slugs will be storming this defense! 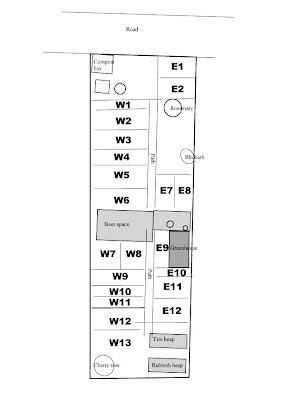 We have established a new plan whereby everything on the East is called E1, E2 etc and the same for the West W1, W2 etc. Beer Space has been mentioned (VERY IMPORTANT!!) 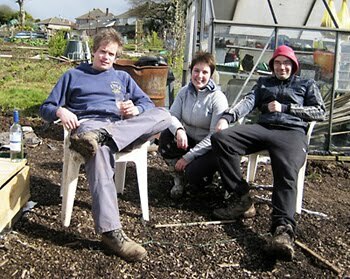 but this can also be called BBQ Space for summer or whatever social activity seems fit for purpose?! Strawberries have been moved to plots W5 & W6 by Karl, Shallots and Onions are in W1 & W2. Chips and Poo are on their way although we have a lot of chips already. 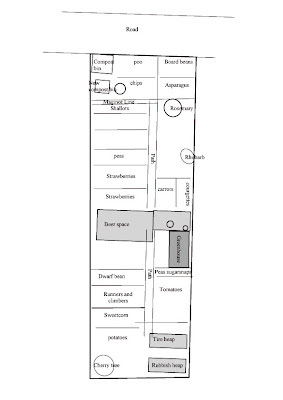 Broad beans (yes, I know it says board beans on the plan) will be Karl's domain and we're giving asparagus another go in the same place. All we need now is some decent weather...! !